Analyzing tunnels, excavations, slope stability, and retaining structures requires nonlinear material models tailored for geotechnical applications. The Geomechanics Module is an add-on to the Structural Mechanics Module that includes built-in material models for modeling deformation, plasticity, creep, and failure in soils, concrete, and rock. 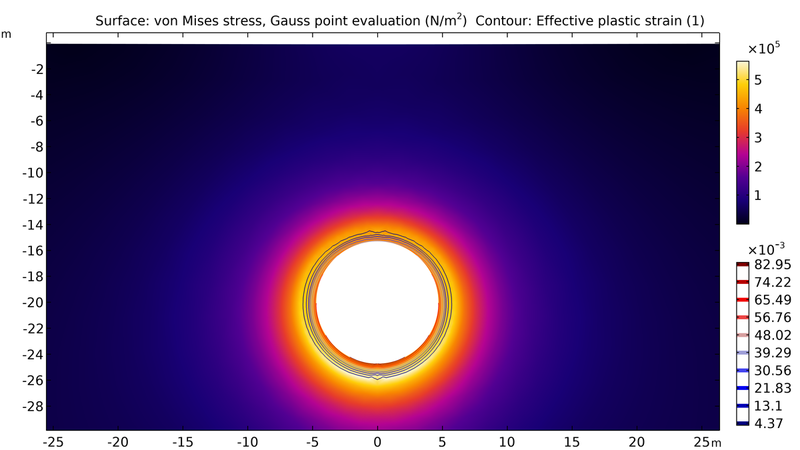 The module also includes standard nonlinear material models to describe metal plasticity through the von Mises and Tresca criteria. In addition to the built-in material models, you can enter user-defined yield functions and input your own mathematical expressions of the field variables, stress and strain invariants, and derived quantities using equation-based modeling. You can also define material properties that are dependent on another variable, such as a computed temperature field or water pressure. 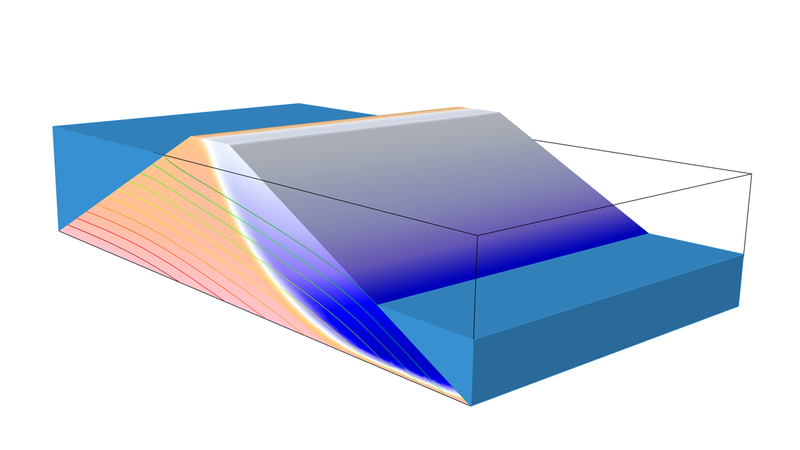 To accurately account for real-world effects and behavior in your geotechnical analyses, you can include multiphysics effects by combining the features and functionality in the Geomechanics Module with other modules in the COMSOL® product suite. 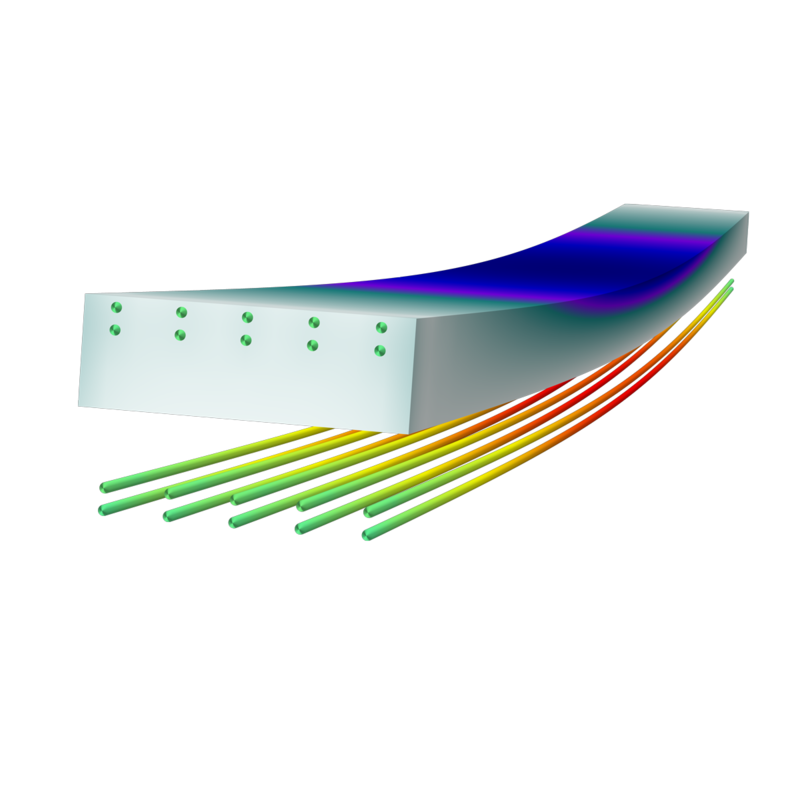 For instance, you can model porous media flow, poroelasticity, solute transport, and heat transfer with the Subsurface Flow Module. A slope stability analysis is run on a dam embankment, with fluid flow through the porous soil described by Darcy's law and the soil plasticity described by the Mohr–Coulomb model. The results show the displacement in the embankment (surface) and the pressure head (streamlines). A model of a tunnel excavation, using the Drucker–Prager yield condition, shows the stresses in the soil (surface plot) and the effective plastic strain (contour plot). The COMSOL Multiphysics® user interface showing the results of a soil excavation with a retaining wall. The wall deflection is shown for different excavation depths, as well as the plastic region at the final state. The Application Builder, included in COMSOL Multiphysics®, enables you to build simulation applications that further simplify the simulation workflow by enabling you to restrict the inputs and control the outputs of your model so that your colleagues can run their own analyses. Working with specific soil, rock, and concrete models, this functionality is especially useful for testing how different materials affect a simulation. With specialized applications, you can easily change a design parameter, such as a geometrical dimension, material property, or boundary load, and test it as many times as you need without having to know the inner workings of the software. You can use applications to run your own tests more quickly or distribute applications to other members of your team to run their own tests, further freeing up your time and resources for other projects. A parameterized simulation application with geometry, material, and load/constraint inputs includes several results and the ability to store simulation results to compare different reinforced concrete beam designs.